It is March 25th, and we got about 8 inches of snow last night. This means my tulips and hyacinth starts are now covered under a thick blanket of winter's last word instead of showing off their cheery greenery. Here's hoping I can survive a few more weeks of this! 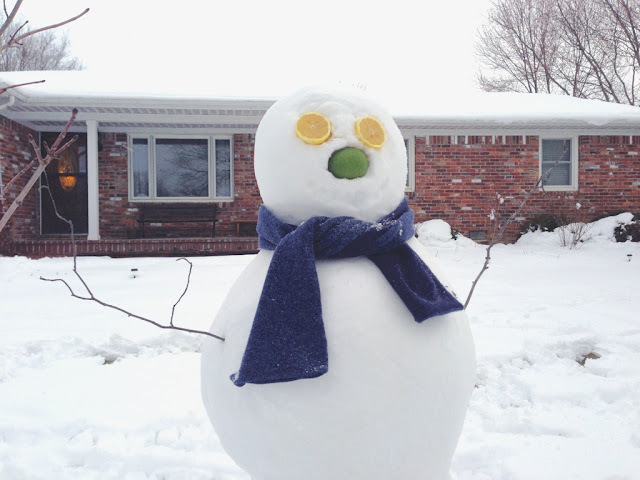 My husband surprised me when I pulled in the driveway today from work today with a completed snowman. At least it adds a little humor to the snow. I'd like to think that my general mood remains unaffected by this type of crappy weather, but I have a husband who might disagree. Come already, Spring, we're waiting on you!